An inquiry into the sinking of HMS Sheffield at the height of the Falklands War has said crew were poorly trained and equipment was inadequate. The ship sank on 4 May 1982 with the loss of 20 men after being hit by an Argentine missile fired from a plane. Details of the inquiry into the sinking have emerged in previously classified documents released under the Freedom of Information Act. They found firefighting was poorly co-ordinated and pumps were "abysmal". The Ministry of Defence Board Inquiry report concluded that submarines had always been thought to be the biggest threat to HMS Sheffield, not an air attack. It also said that had the right reactions taken place in quick succession, it could have been possible to intercept the airborne missile before it struck the ship. Despite the criticisms though, there was no case for any courts martial, it said. Some details have been removed from the document, including what appear to be names of crew who did not perform adequately. Further documents including the captain's report are due to be released before the end of the year. 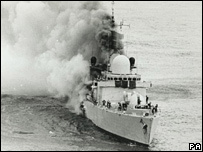 The 4,100-ton destroyer was the first of four Royal Navy ships sunk during the Falklands War. It caught fire when a French-made Exocet missile penetrated deep into the control room.